Passarella and the other Valley Forge coaches talking with their players during the 2018 season. When questioned about what he looks for in a recruit, Coach Passerella, Defensive Coordinator of Valley Forge football, emphasized countless times the value of not only being a good player, but more importantly a good person. In the past, recruiting was done a lot in person. Coaches would travel to high schools on Friday nights in the fall and watch live games. Nowadays, Passarella can easily go on his computer, head to Hudl and watch highlight reels of players across the country. It makes his job easier, but it is much harder to tell what kind of person someone is just by watching a video. Because of this, he will also connect with coaches, and among the first questions he asks is about the personality of the recruit. At Valley Forge, they clearly stressed that football is not the most important aspect of a potential student athlete. Sure, it does help to run a 4.4 40 yard dash and be 6’5”, but there are more important things to the coaches. The first thing that Passarella looks at is their personality. They are looking for kids who will buy into the system for their 2 years in JUCO and not be a “locker room cancer.” Second, they need athletes who are good students. Academics are really important, especially for those athletes who attend Valley Forge and look touse it as a stepping stone to get to the next level. Some of the best athletes that Passarella has had in recent years would have been able to go play top end Division 1 football, but they could not keep their grades up and lost that opportunity. While recruiting, Passarella is really looking for kids that can become impact players and leaders for their team. 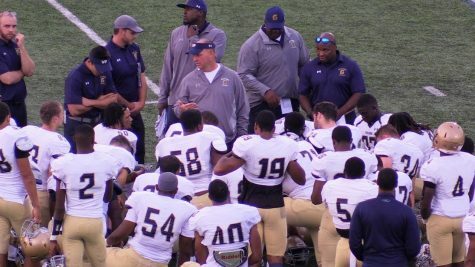 Whatever type of leadership his players have, whether they be vocal and loud or quiet and lead by their example and hard work, the coaches at Valley Forge look for it and want players that can bring that into their program. So, for anyone who ever hopes to attend Valley Forge or another school for football, they should know that coaches are not only looking at their play on the field. They are looking for good people who will buy into their culture and work hard. They want student athletes who will take academics seriously. They want hard workers who help to lead all the others. And, it would help to get recruited if you are a good football player as well. Johnnie Banks is a current senior and serves as Captain of the Lacrosse Team. He plans to go to college and hopefully study Engineering.